Well known household brand for over 40 years. In its early days of supplying necessary products for the average household in Trinidad and Tobago, Albrosco offered Teddy Scourers in plastic and wire. Today we have added many solutions for your cleaning needs. 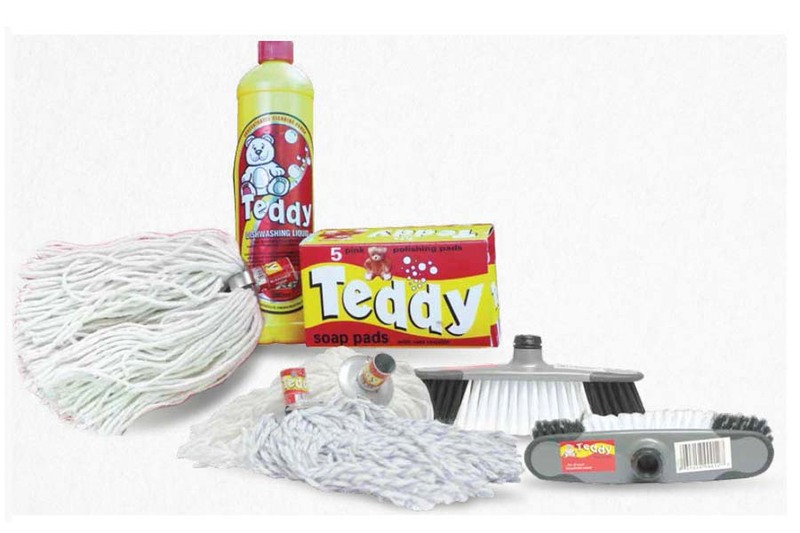 Teddy is the main brand that we sell. We are proud to say that you can find Teddy Dishwashing Liquid in your local food store and grocery. You can also find Teddy Stainless Steel scourer, Teddy Scotch Brite and Teddy Sponge Scourers. To clean that burnt-in grease off your pats use our best steel wool product: Teddy Stainless Steel Curly. Teddy Soap Pads has also been used satisfactorily for many years. What is a line of cleaning products if you don’t have the mops and brooms included. Whatever your preferences or needs, Albrosco has the size that gets the job done. The size of the mop is the length of the yarn on the mop. There is #12, #14, and #16. We have coloured and plain white yarn. We sell mops, brooms, dust pans and toilet bowl brushes for household use and industrial use. We also carry mop and broom sticks.